What’s the cost of living in Madrid like? I’m going to attempt to answer that question here. Your personal cost of living depends a lot on what kind of lifestyle you have, which neighborhood you live in, your material expectations and a lot of other factors. In any case, I can give you a list of approximate prices for basic necessities here in Madrid. assuming you’re going to a reasonably-priced place to shop or eat. Like in any major city, there are high-end places for everything, as well as really cheap places that will cost less than the prices I’ve listed here. By the way, before we go on, people are always asking about the best way to send money internationally – for me it’s Transferwise. You can get a commission-free money transfer from them if you use my affiliate link right here. Here’s a list of basic items you’ll probably need at some point if you’re living in Madrid, and their prices as of now, in 2019. Of course, as I’ve already mentioned, there’s a wide range for everything. When I say a liter of milk costs 70 cents, well, I’m sure you could go to the cheapest supermarket and get it for 50. And you could also go to one of the more expensive places and pay a full euro or even a bit more. Rented flat (depending on size) 500 to 1000€ or more, depending on the neighborhood. Outside the center, logically, you’ll pay less. Everything is more expensive in the city center. Most things aren’t terribly expensive, as you can see, because most people in Madrid simply don’t earn a lot of money. And prices are a lot lower in Madrid than in other European capitals like London or Paris. On the other hand, if you’re living in small-town Spain, you might be shocked at how cheap things are in comparison. 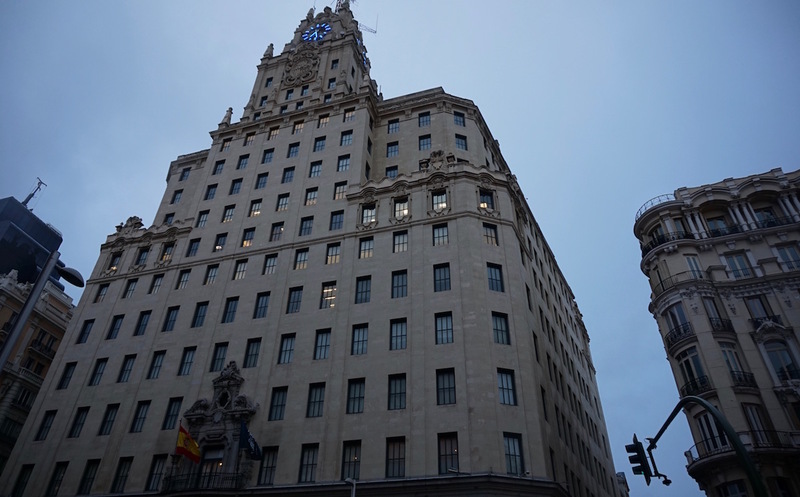 Living in the Telefónica building might be kind of expensive, but you can try for a place nearby in Malasaña. prices. The cheapest places that are still pretty decent / fashionable are H&M and Springfield. Zara is a bit cheaper here than in other countries, I believe, because it’s a local company. Anyway, there are clothes for every budget. Head up Calle Serrano to look at 8000€ handbags one day if you’d like to put your meagre salary into perspective. A note about transport: If you’re under 26 (I think) you can get an “abono joven” – a monthly metro pass which will take you all over Madrid and to a lot of the smaller towns too for about 20€ a month. A lot of things are more expensive here than in the US – the UK I’m not really sure. For example: any American brand will probably cost more here. For one thing, a lot of them are able to market themselves as “premium” over here. Levi’s is a good example – I’m gonna die alone and pantsless before I drop 100€ on a pair of 501s. is a staple food, used for everything, and quite inexpensive compared to US prices. I’m not sure about the prices of internet other places, but I’ve heard Spain is expensive by comparison. I personally pay about 75€ a month for land line (which I never use) plus mobile plus high-speed internet, and it doesn’t seem too bad. But by all means, shop around. About food in restaurants: you can eat lunch in a lot of places for anywhere from 8 to 20 euros. Restaurants usually have a set menú del día at lunch with a couple first courses, a couple of mains, and a drink – the quality varies widely from place to place. You can get a decent menú for around 10 or 12 euros in any number of places around Madrid. Dinner usually costs more, because there’s no menú – so be prepared to spend 20 to 30 per person if you go out. Books in English cost a lot more than in the US, if you go to a bookshop, but you can go to amazon.es and get whatever you want these days. (I buy a lot of random stuff like small electronics and vitamins on Amazon these days, because it ends up being much cheaper and easier. Anything I’ve left out? Anything you feel is wildly inaccurate? Gimme a shout, right here in the comments. P.S. I hope you’ve learned something about the cost of living in Madrid. If you want to know more about this great city, I’ve got a list of the pros and cons of living in Madrid. And also, 5 reasons why living in Madrid is awesome. P.P.S. If you’ll be teaching English while you’re here – and a lot of people are – you might want to take a look at this new article: Can you make a living teaching English in Madrid?